•	Load ranges from 50kg up to 800kg per wheel. 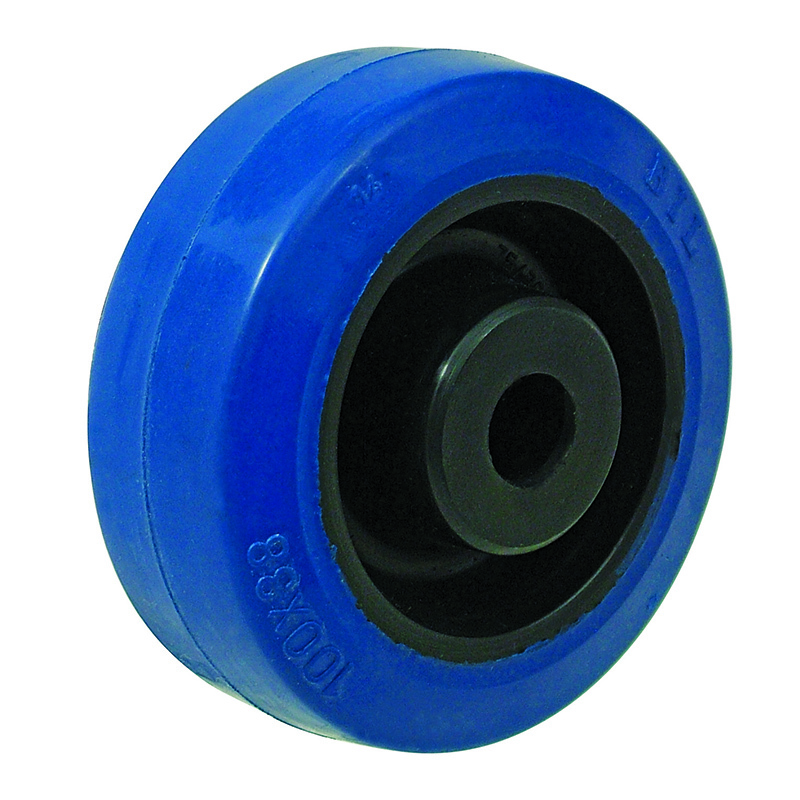 Blue 72 shore A elastic rubber tyre on black nylon centred wheel with a roller bearing. Diameter 80mm, tread width 34mm, bore size 12mm, hub length 40mm. Load capacity 200kg. Black rubber tyre on cast iron centre with a plain bore. Wheel diameter 150mm, Tread width 50mm, bore size 20mm, hub length 60mm, load capacity 300kg. A blue 75 shore A elastic rubber tyre on black nylon centred wheel with a roller bearing. Diameter 100mm, tread width 36mm, bore size 12mm, hub length 40mm. Load capacity 160kg. Blue elastic 75 shore A rubber tyre on black nylon centred wheel with a plain bearing. Diameter 100mm, tread width 38mm, bore size 15mm, hub length 48mm. Load capacity 250kg. 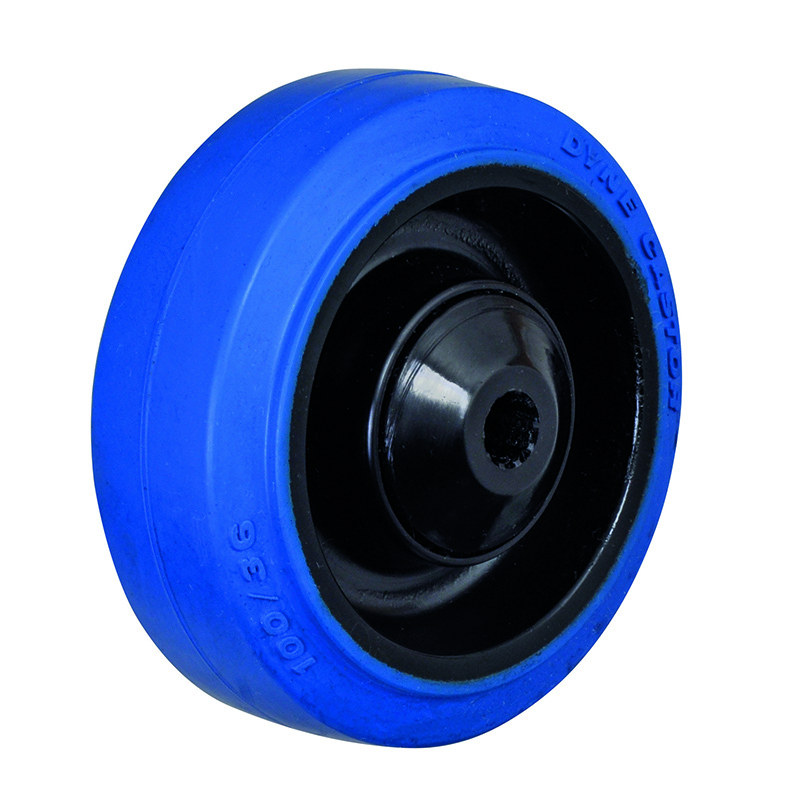 Blue 75 shore A elastic rubber tyre on black nylon centred wheel with a roller bearing. Diameter 100mm, tread width 38mm, bore size 15mm, hub length 48mm. Load capacity 250kg. A blue 75 shore A elastic rubber tyre on black nylon centred wheel with a plain bearing. Diameter 125mm, tread width 36mm, bore size 15mm, hub length 45mm. Load capacity 200kg. A blue 75 shore A elastic rubber tyre on black nylon centred wheel with a roller bearing. Diameter 125mm, tread width 36mm, bore size 15mm, hub length 45mm. Load capacity 200kg. A Blue 75 shore A elastic rubber tyre on black nylon centred wheel with a plain bearing. Diameter 125mm, tread width 40mm, bore size 15mm, hub length 48mm. Load capacity 250kg. 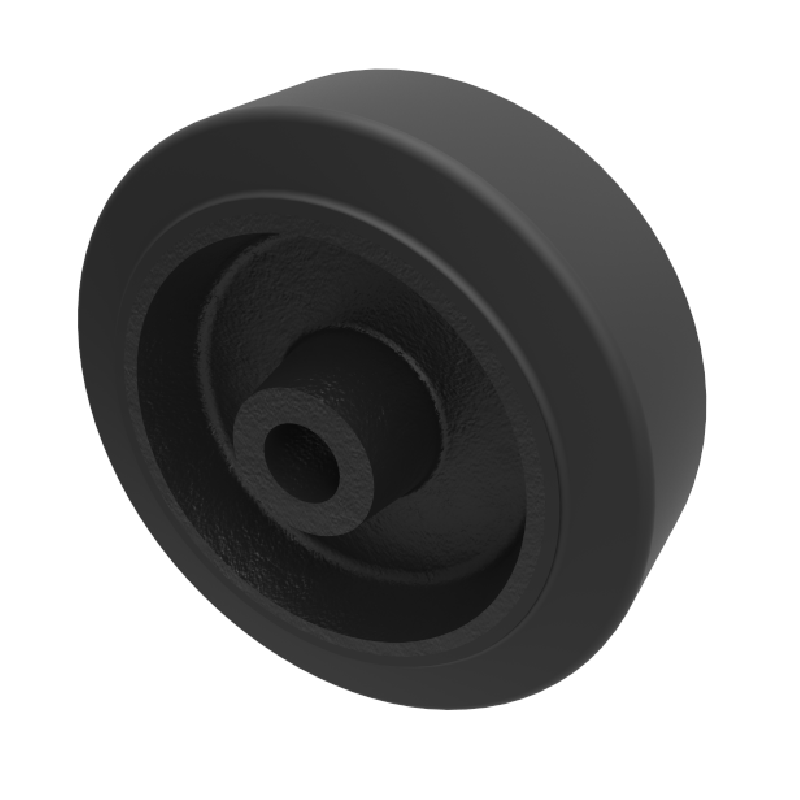 Black rubber tyre on cast iron centre with a roller bearing. Wheel diameter 200mm, Tread width 50mm, bore size 25.4mm, hub length 60mm, load capacity 450kg. Black rubber tyre on cast iron centre with a plain bore. Wheel diameter 200mm, Tread width 50mm, bore size 20mm, hub length 60mm, load capacity 450kg. A blue 75 shore A elastic rubber tyre on black nylon centred wheel with a roller bearing. Diameter 125mm, tread width 40mm, bore size 15mm, hub length 48mm. Load capacity 250kg.